Today, I wanted to give an example of my process from start to finish to show what I do to find people, sometimes successfully, and sometimes unsuccessfully to expand my family tree. I am going to start with Johann Conradt, he’s long since passed away, so I don’t think he’ll mind. My first step is to load up MyHeritage and go into the family tree. From there, I’ve gone to Johann, and as you can see, there is a green and white icon in the top right of his entry. When I hover over this icon, it says: “Smart Matches – Click to view Smart Matches to people in other family trees.” When I click this, it brings up the following information. This is a comparison, built from 52 other family trees on MyHeritage. Typically, if I were missing information, I would click Copy and Edit details and quickly move over missing information. You can see on the right the number of people that have added different pieces of information. For example, there are five people that put the date of death to only be 1615. What I’m looking for today are Johann’s parents. At the bottom is the relatives section and it lists parents, spouses, and children. 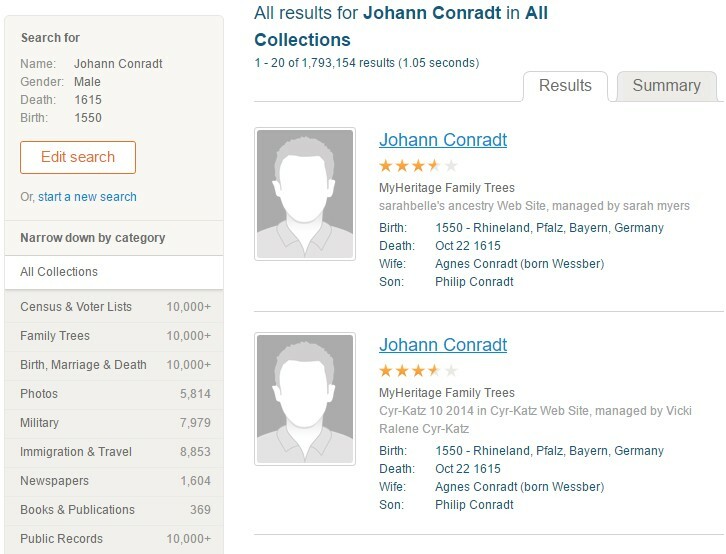 Unfortunately, for us, Johann’s mother is just listed as End Line Conradt, Unknown Conradt, and Conradt. This means we likely won’t be able to use MyHeritage to figure out his mother’s name. When we look at his father’s name, we see Herr Conradt. Without knowing any German, I can say that there appears to be something off with his name. I felt like Herr was a title more than a name, so I did a quick Google search. Unfortunately, I was correct, and Herr basically means Mr. You’ll find this often in old records where they didn’t know the first name, and so they’ll put in things like Mister, Mr, Unknown, Father, and etcetera. Clicking on this brings you to a page with the research results. This includes all of the family trees on MyHeritage, Census reports, Birth and Death certificates, and much more. Often, it will also include newspaper clippings that are completely irrelevant to what I’m looking for, which can be frustrating. Typically, you are looking for information boxes like the one displayed in the image below. What you do is scan those records for a listing of his parents. There are dozens of pages to go through sometimes, but what you’ll find sometimes is someone that doesn’t have his wife or the child you have added, but instead has the parents. Unfortunately, after a few pages of searching, I didn’t see anything that lined up for Johann’s parentage. My next step is to go to Ancestry.ca and sign-in there. I go to the Search – All Collections option and enter Johann’s details. The records come back with 15,841 results. Most of them pictures of German flags, pictures of the city he was born in or died, copies and copies of marriage certificates for his wife. A great deal of it is duplicate information, and quickly, as you move down the list, it gets even less relevant. But, at the top, there is a Matching Person from one of Ancestry’s family trees. 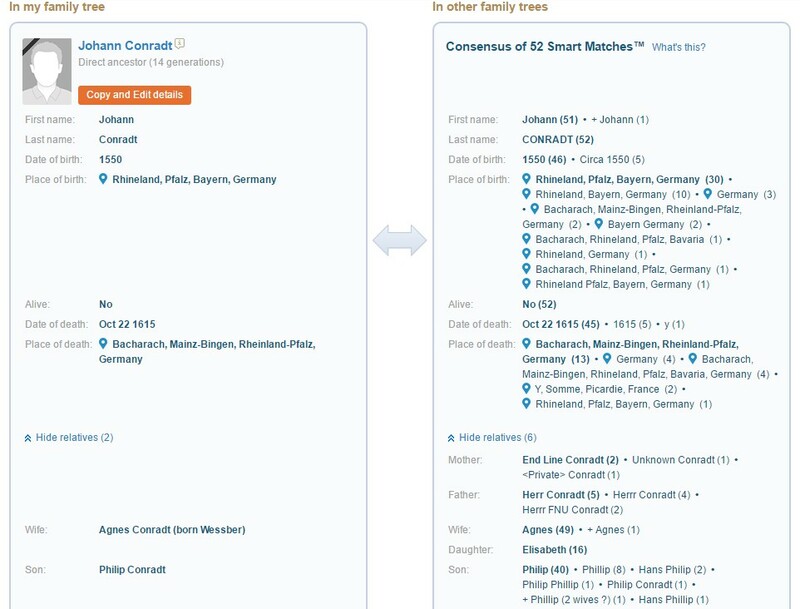 I can already see that it lists his parents as Herrr Conradt, so it likely isn’t going to be able to provide me any more information, but I always check it out to confirm. Sometimes, a record will list a sibling, and via that sibling, you can find out who the parents were. That doesn’t always work due to step-parents and other factors that can come into play, but it is a helpful tip for those stuck going backwards through time. Unfortunately, this isn’t one of those times. I go back to the search results on Ancestry and scan through them the best that I can, looking for anything that might give me a clue on Johann’s parents. Sometimes, you’ll find a document from a book that discusses the heritage of a family. Many documents haven’t been completely digitized yet, which means that while they might be tagged with a name, you have to read the full text to find out how useful the enclosed information is. Also, there are member stories that sometimes have information that will provide you with more information that will lead to that next great discovery. You need to take member stories with a grain of salt though as sometimes the telephone effect has mangled the truth. I’ve found this to be true more often with families where there are three generations of people that all have a family member with the same first name. Did John have two wives, or did his son John have that wife? Was that his grandpa that served in that battle? It can be very difficult to pin down the truth, especially when it has just been passed as word of mouth through the generations. Next, I head over to Geni to see if there is anything there that I can find that will lead me to Johann’s parents. There are lots of Johann Conradt’s listed, but none from 1550 – 1615 that stand out to me as the one I’m looking for. 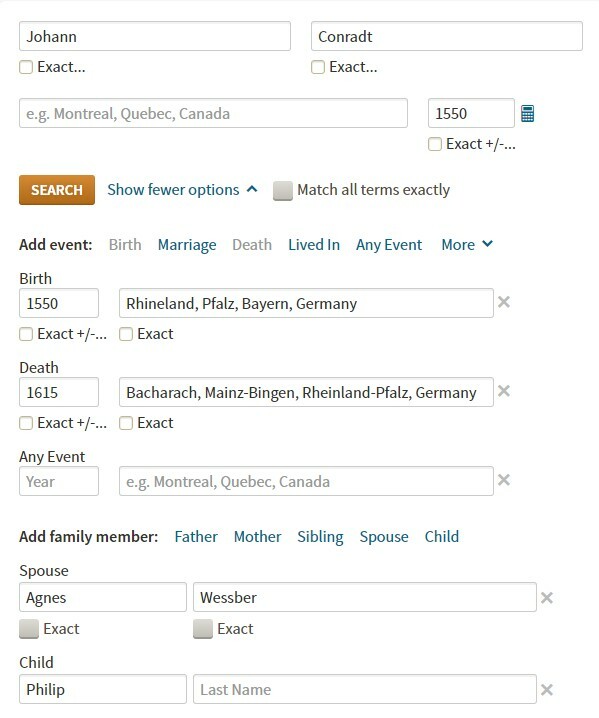 I run the same sear at FamilySearch.org to see what it comes up with and unfortunately, don’t see anything that will help me. Finally, I search OurFamilyHistories.org and get no results, so I move on to a Google search. I input Johann Conradt 1550 to see if it comes up with anything, and while many of the first listings are the right Johann, they don’t lead me to his parents either. At this point, I have to conclude that I won’t find Johann’s parents at this time, and will move on to another person in the family tree and start the process over again. I have done this kind of thing over and over trying to extend the branches of my family tree upwards into the past. There are places, like in England and France that seemed to keep better records, and often this process is more successful, and often each new person will lead to a few others, expanding the tree faster than the example today. I no longer find it disheartening to hit a roadblock like this as I’m related to millions of people around the world, and some of the lines I’ve been able to trace using this method go back thousands of years. If you are interested in genealogy at all, I suggest spending the time and money to build your own family tree as there is almost nothing that will make you feel more connected with the world.